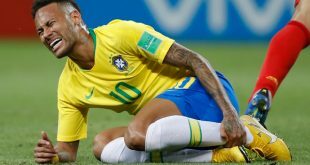 MOSCOW, June 9, (AFP): Neymar’s acclaimed return ahead of the World Cup supplied Brazil with an immeasurable boost, but holders Germany and Argentina arrive at the tournament confronting inconsistent form and disrupted preparations. The Paris Saint-Germain s u p e r s t a r ’ s swashbuckling display in a 45-minute a p p e a r a n c e against Croatia last weekend largely dismissed lingering concerns over his fitness after more than three months out with a fractured foot. 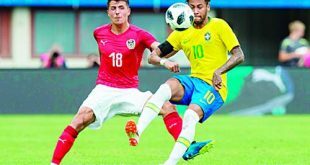 The 26-year-old admitted he was only at “80 percent” but promised he would be raring to go come Brazil’s first game at the finals against Switzerland on June 17. “For the first match back I actually expected less from him! I would have been happy with a quieter performance,” Brazil coach Tite said of Neymar. “What he did was really extraordinary.” Brazil’s form under Tite, appointed midway through a faltering qualifying campaign, suggests it will be difficult to stop the five-time world champions from adding another title in Russia. A reinvigorated Selecao have won 16 of 20 matches with the former Corinthians boss at the helm, a 1-0 loss to Argentina last year in Melbourne the only defeat since he took charge. Spain, unbeaten since Julen Lopetegui was named coach after Euro 2016, are back among the genuine contenders after a catastrophic 2014 World Cup and another early exit the European Championship. “Spanish football has lived through an extraordinary, historic period in 2008, 2010 and 2012, but after that the team has not found the same consistency or success,” Lopetegui told AFP. “We have to grow again as a team. We have the biggest ambitions but we are also very aware that we arrive at this World Cup feeling humble and wanting to prove ourselves.” Spain cruised through a qualifying section featuring Italy, and delivered a further warning to their World Cup rivals with a 6-1 demolition of Argentina in March. But they will be tested immediately in Russia when they launch their group stage campaign against Cristiano Ronaldo’s Portugal on June 15. Manuel Neuer’s comeback following eight months out with a foot injury has given Germany a much-needed shot in the arm, with Joachim Loew’s side struggling to hit their stride ahead of their title defence. An unconvincing 2-1 win over Saudi Arabia on Friday halted a five-match winless run, although Ilkay Gundogan was booed by Germany supporters after meeting Turkish President Recep Tayyip Erdogan and calling him “my president”. “The fact that a national player is booed like that helps nobody,” Loew told broadcaster ARD, insisting the incident be put in the past. “He took a picture, okay, but he has addressed it with the press and underlined his support for German values. “The topic has to be ticked off.” Argentina’s build-up was jolted by the cancellation of a controversial friendly against Israel in Jerusalem, a fixture set to be their final outing ahead of the World Cup. The sold-out game had been due to take place on Saturday but was hotly opposed by Palestinians, who claim the eastern part of the city, annexed by Israel, as the capital of their future state. With goalkeeper Sergio Romero already ruled out, Argentina’s plans were further complicated by the loss of Manuel Lanzini to injury, but team manager Omar Souto believes all is in place for a successful competition. “I have been at five World Cups and this is the best set-up because it has everything… there’s never been a place like this for the national team,” he told AFP, with Argentina due to arrive at their Bronnitsy training base, 40km southeast of Moscow, later on Saturday. A hugely talented France squad head to Russia with high expectations, but Didier Deschamps is still struggling to find a system that will enable him to unlock the full potential in his team. Paul Pogba, who will have a huge role to play if France are to succeed, was jeered by a smattering of home fans after an underwhelming performance in a recent 3-1 win over Italy. “People talk a lot about Paul. He’s a midfielder, he’s not a number 10, nor a forward,” said Deschamps. “He has the ability to score goals and create them, which he does often. He’s a complete midfielder: he can do everything but he can’t do everything.” Unburdened by modest expectations, England’s youthful side will go into the tournament riding a 10-match unbeaten run that stretches back nearly a year. Gareth Southgate admitted he faces a selection dilemma after Marcus Rashford starred in a 2-0 win over Costa Rica, but a reasonable draw could allow them to reach a first World Cup quarter-final since 2006.